I didn't known this until my sister in law introduces me to try to put salt in your watermelon. It is really funny at first because to where I was from? We don't put salt in our watermelon especially when it is really ripe and sweet. So we can appreciate the good taste of a ripe fruit. One day when she came over to our home to hangout with me and my son. She noticed that we have a watermelon and would like to try what she heard from the southern area. The watermelon season will soon be over because summer will also be over soon. That is why I am doing to eat as much as I can and enjoying the salt and watermelon taste too. This kind of fruit is the best to bring when you go camping with your family. And speaking of which I want to make sure that once the sale of a camping gear be in season. I'll be able to buy one that way we will be able to have a new gear next year. 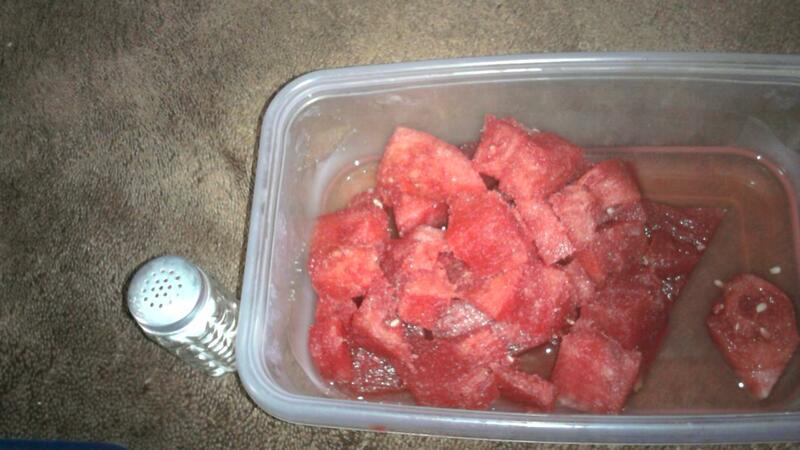 it was my bro in law that told us to try and put salt on watermelon, i didn't think i wud like it but i did. so i have been eating my watermelon with salt, hehe. luv it! Ay ate, I also do that, I put salt on fruits like water melon. yummy! Even in apple and pineapple, love it very much. @Jenn: it's pretty addicting eh?? ?